Grinding concrete on the industrial floor is a preparation method for removing previous floor coatings, smoothing bumps and leveling unevenness. It uses the most aggressive type of diamond blade to remove thin film floor coatings; and is often a first step in concrete polishing. Industrial concrete floor preparation by grinding, Concare, provides a smoother concrete flooring surface, so when the new floor coating is applied, it will appear uniform and smoother. The grinding process replaces and eliminates pulverization methods like shot blasting, creating less micro-fracturing in the concrete, and often improving adhesion as a result. Micro-fracturing can create tiny fractures at the surface of the concrete that can cause the concrete to loosen, a mini-version of scaling. Grinding is a gentler way to remove thin film coatings without damaging the integrity of the concrete. 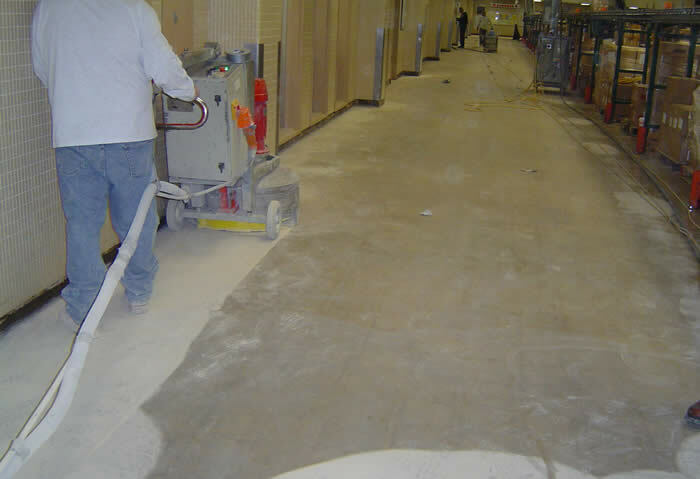 Grinding concrete can be used in conjunction with other methods of floor removal such as shot blasting, scarification, pressure cleaning, even milling. These other methods remove thicker concrete coatings and grinding concrete can then be used to complete the finer finishing. Concare's experienced and highly trained floor preparation and installation team, knows how to properly prepare and repair industrial floors including pharmaceutical, retail and food processing plant. All installers are 100% employees of Concare utilizing 100% owned equipment. Contact Concare, your flooring polymer contractor specialist, to evaluate your existing floor coating.